The Chestnut Children's Center prides itself on the exceptional quality of its caring and capable staff. The Center's founder and Executive Director, Lauren Hentschel, has a Master's degree in Early Childhood Education and has worked in the field since 1990. As both owner and operator, Lauren sets the tone for the Center's professional and nurturing environment and is always available to meet with parents to discuss their children's development. Jamey has been a part of Chestnut Children's Center since 1999. She began her career at CCC as a teacher working with all age groups. Jamey was a Lead Infant teacher for 8 years. She assumed the Assistant Director position in 2009. 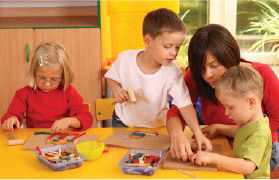 All of our teachers are childcare professionals trained in early childhood education. They meet or exceed Massachusetts Department of Early Education And Care certification requirements and participate in at least 20 hours of early childhood training per year. Chestnut Children's Center conducts a thorough employment and criminal records background check all on all employees. As your child's safety is of utmost concern, all full-time staff are required to maintain first aid and CPR certifications. The Chestnut Children's Center staff reflects a singularly high standard of care and each teacher brings to his or her classroom a unique personal style. From room decorations and story selections to special themes and activities, children benefit from the special interests and skills of a diverse group of committed teachers.